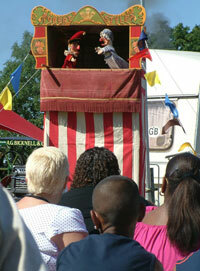 The show is self-contained and can be performed either indoors or outdoors. The duration of each performance is approximately 20-30 minutes. 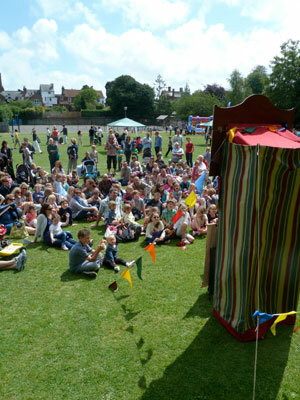 The use of a VHF wireless battery operated sound system enables the booker to position the Punch & Judy show anywhere on site without the need for extension cables and the associated health and safety risks. 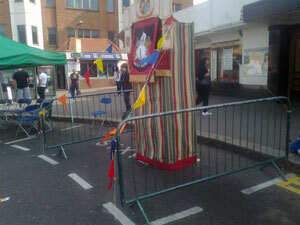 The site chosen for Punch & Judy should be immediately visible to the public, preferably on or near the main thoroughfare, and in a position that avoids the audience having to look up into the sun whilst watching the action. 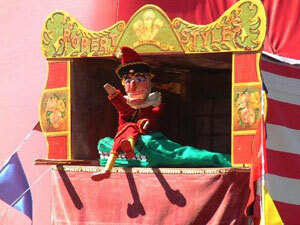 Mr. Punch can draw large crowds so ensure you allocate enough space. 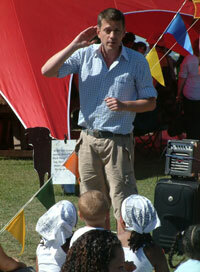 As guy ropes will be needed to anchor the theatre outdoors, a grassy/soft surface site is preferable to a hard surface. If Tarmac is the only option, a nearby fence, railings, benches etc., should be considered as alternative anchor points. The close proximity of noisy attractions, power generators, fairground rides, disco music, arena/stage events. 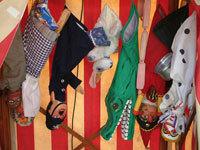 etc., will seriously jeapordize the success of the Punch & Judy show. Careful consideration with regard to such competition, and the position and timings of the Punch & Judy show would be most appreciated.